Twitter social network to identify the mini through the official blog today unveiled provided to the property over the network to include video clips published within the web easily, through the script for the network Ptulladh videos. This, and become any user click on the Settings facilities to any tweet button containing a video clip, to show him Embed Video option, and when the user presses this option, you will have a script language HTML copy and paste it can within its location in the right place, to show his Tweet can that contains the video on the website directly. 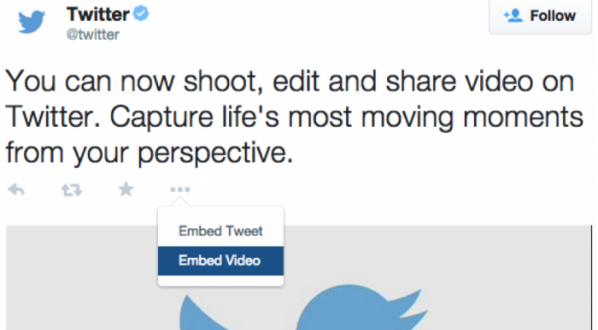 Through this feature, the video clip is a simple will appear by mid button to turn the section, in the bottom of his Tweet that contains the video name, and in the far bottom right corner of the network "Twitter" logo, which appears Tweet facilities and text information for video when clicked. The company explained that the videos included within the feature pages of sites available to all sections that have been filed on the network directly, depending on the official Twitter application on Android and iOS, as well as partners in the program Twitter Twitter Amplify. This feature launched by the network "Twitter" Social which, similar to the property provided by the "YouTube" platform when you press the right button of the video clip, which, appears to you via the drop-down list of options (get code modulated) Get Code. To be able to post the video clip through your personal accounts.